Situated on 20 acres, at the intersections of Highways 7 and 59 in Montevideo, MN; Historic Chippewa City is home to 24 buildings replicating a late 1800's village, complete with town square and boardwalk as well as a centrally located bandstand/gazebo. Begun in 1965 with the preservation of a one room schoolhouse, Historic Chippewa City has become the "crown jewel" of sites in Southwestern Minnesota. 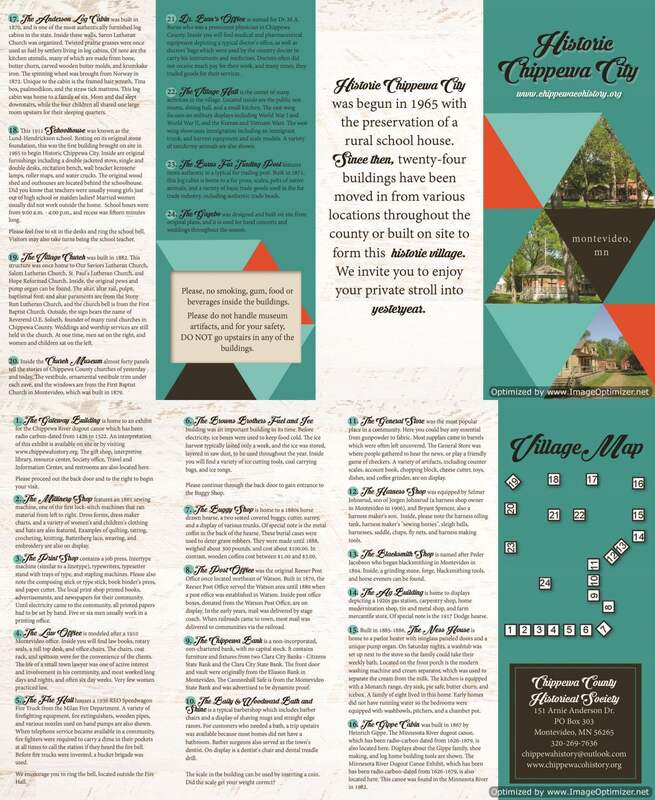 Your self-guided tour will take you directly into all 24 buildings. 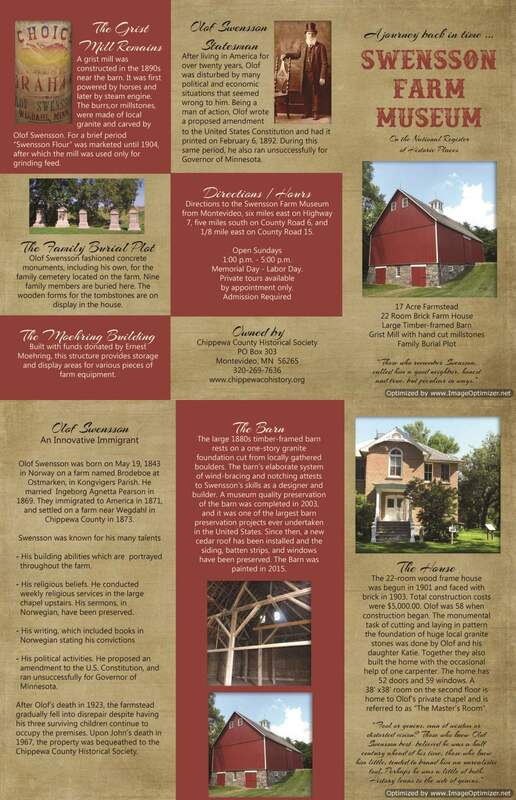 Visit our authentic log cabins, 1880's church, Millinery Shop, Blacksmith Shop, General Store and many others. 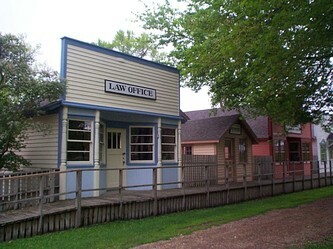 Historic Chippewa City, a sure hit for all ages! “The bestest place I’ve ever been too, except for Disney World” from one of our young guests! 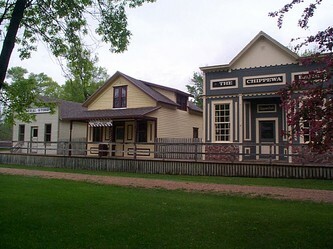 Portions of the movie “Sweet Land” were filmed at Historic Chippewa City, as was the PBS documentary “Death of a Dream”. 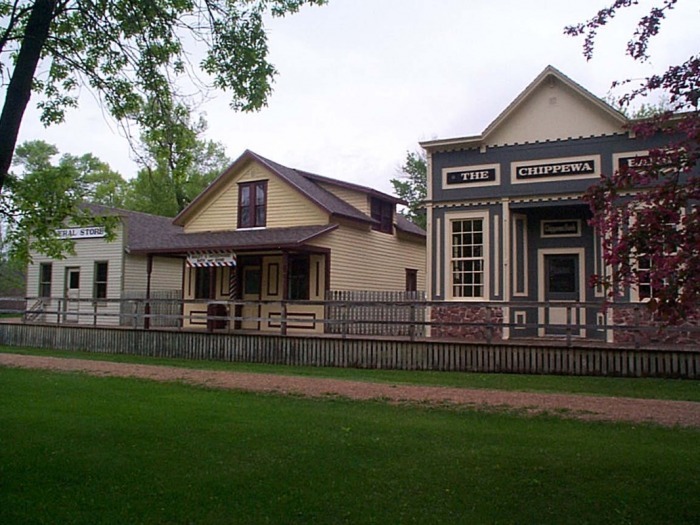 Historic Chippewa City has also inspired renowned artist Terry Redlin. His Doctor series features the Chippewa Bank Building, and you will notice many of his log homes replicate those at this site. 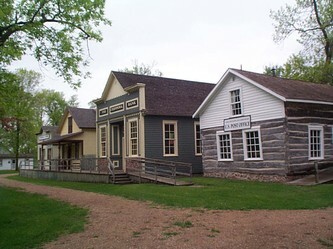 Historic Chippewa City opens on Memorial Day Weekend. Hours from Memorial Day Weekend through Labor Day Weekend are Monday through Friday 9 a.m. – 5 p.m., weekends and holidays 1 p.m. – 5 p.m. September hours after Labor Day are Monday – Friday 9 a.m. – 5 p.m. The site is also available for private tours, weddings, family reunions, and business meetings. Admission required, free parking. See the video belowfrom Lakes Country TV/Lakes Country Living to learn more about the history of Historic Chippewa City. Located 6 miles east of Montevideo, MN on Highway 7 and 5 miles south on County Road 6, this turn-of-the-century 22 room brick farm home is situated on a 17 acre farmstead. Also located on this farmstead are a large timber-framed barn built in the 1880's, grist mill remains and private family burial plot. The unique barn features an elaborate system of wind-bracing and notching which attests to Swensson's skills as a designer and builder. Your self-guided tour through the Swensson family home will be highlighted by the 38’ X 38’ chapel located on the second floor. The loom, also located on the second floor was made by Mr. Swensson, as were the spinning wheels. Olof Swensson was one of Minnesota’s most innovative immigrants, and this family homestead epitomizes the immigrants dream. Swensson was a farmer, self-taught scholar, man of letters, visionary prophet, statesman, carpenter, bricklayer and self professed lay-minister. 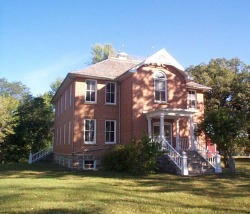 The farm site was bequeathed to the Chippewa County Historical Society in April, 1967 by the last surviving heir of the Swensson family, John Swensson. Join us for a visit into history! Many parts of the movie “Sweet Land” were filmed in the home, barn, and on the grounds. DVD’s of the movie are still available. Contact us ChippewaHistory@outlook.com. In 2003 a museum quality preservation of the Swensson Farm Barn was undertaken. Grants and fundraising for this project began in 2000. By 2003 the preservation was completed at a cost of over $300,000.00. 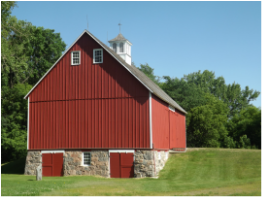 Since 2003, additional work has been completed on the Barn, including a new cedar roof, siding and batten strip preservation and replacement, window preservation and replacement, and in 2015, the Barn received a new coat of paint. To remove the old paint, we used corn cob blasting. Over this almost 15 year time frame, the Chippewa County Historical Society has invested almost $500,000.00 into the preservation of this majestic barn. We hope you enjoy it as much as us! The Swensson Farm Museum opens to the public on the Saturday of Memorial Day Weekend and is open Saturdays and Sundays from 1 p.m. – 5 p.m. through Labor Day Weekend. Private tours are available by appointment only. The site, including the grounds, barn, and house, is available for weddings, family reunions, business meetings, etc. Admission required, free parking. 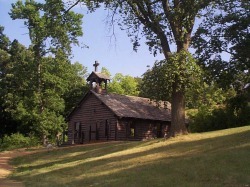 Come see the site where the first church bell tolled in Minnesota and where the Bible was translated into the Dakota language at the Lac qui Parle Mission, located 6 miles north of Montevideo, MN on Highway 59 and 2.2 miles west on County Road 13 overlooking beautiful Lac qui Parle Lake. Walking paths and interpretive signs will lead you through the area where a small group of Protestant missionary families lived. Inside the reconstructed WPA building, exhibits describe the missionaries and their work, the Dakota people and Joseph Renville, the man who linked their worlds. Come, ring the church bell and hear echoes of our past! The Lac qui Parle Mission opens the last Sunday in April and is open daily from 8 a.m. – 8 p.m. through Labor Day Weekend. Private tours are available for the site. This site is available for weddings. No admission required, free parking. 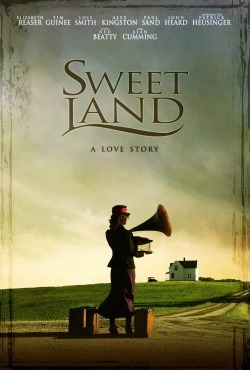 To order a copy of the "Sweet Land" DVD contact us at ChippewaHistory@qwestoffice.net. A limited number of copies are still available!